A college student who had successfully climbed Mount Everest in May today spoke of five climbers she had seen battling for life on the slopes of the world's highest mountain during her expedition. Trishala Gurung, 23, from Southfield College was part of the first all-girl team of the National Cadet Corps that conquered Mount Everest. 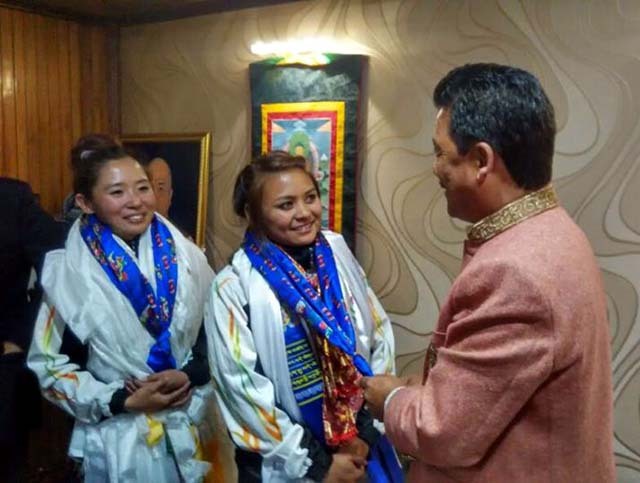 She, along with Sulaxchana Tamang, who studies at Ghoom Degree College in Darjeeling, climbed Mount Everest in two batches last month. While Sulaxchana was part of the first batch to climb Everest and had left the base camp on May 18, Trishala had started the climb, along with 13 other members of the NCC group, the next day. It was Trishala and her team that encountered the climbers who were battling for their lives. "Around 11pm on May 21, when we were above South Col (26,000ft), we met a climber who was digging ice. It was on a slope of about 70 degrees and first, I thought why he was wasting energy at such a high altitude by digging ice, which seemed unnecessary. Now, I think he was suffering from altitude sickness," Trishala told the media. The team, which had set base at South Col, had started its trek for the final accent at 8.30pm on May 21. "A little above, we found a Sherpa and a lady climber. The Sherpa asked for water but I couldn't give, as I was wearing a thick glove and the water was deep inside my bag so that it didn't get frozen. They said they were hungry and I managed to give them chocolates and dry fruits," said Trishala. Fifty meters above the Sherpa and the lady was another climber hanging on a rope. "We didn't know whether he was climbing up or down and just above him was another man who was resting and moving his hands probably trying not to fall asleep," said Trishala. She reached the summit, along with three other NCC cadets, an army officer and six Sherpas, at 8.30am on May 22. "Later, when we were descending, we found that the man who had been seen moving his hand had died. He had anchored himself safely so that he would not fall. We did not see the other man on the rope, or the lady and the Sherpa with her," said the Southfield College girl. However, Trishala and the army officer, Bishnu Rana, met the man who was digging ice. "It seems he was moving in an opposite direction where the ropes were tied. He seemed to be suffering from snow blindness and had frostbite on the hands. He said he was from Calcutta and even though he said his name, I cannot recollect it now. When he said he was from Calcutta, it struck me that we were from the same state," said Trishala. Trishala and her team had by then been informed about some missing climbers. "The description matched the man who said he was from Calcutta. We tried to get him down to South Col but we couldn't. The only way was to carry him and we could not despite our attempt," said Trishala. The team then reached South Col in about 20 minutes and immediately, Sherpas climbed up and brought the Calcutta man to the South Col.
"One of the Sherpas, Migma Dorjee, made tomato soup and he had it. We then gave him coffee but when the mug was handed over to him, he could not hold due to frost bites and the coffee spilled over the mat. It was so heartbreaking when he immediately kneeled and tried to lick the coffee from the mat," said Trishala. The Calcutta climber was kept in a tent which was abandoned by pervious climbers. When the Sherpas went to serve tea to him in the morning, the climber was found dead.